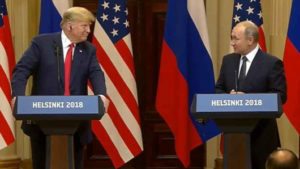 The United States and Russia “will work jointly” to ensure the security of Israel at its border with Syria, President Donald Trump said after meeting with Russian President Vladimir Putin on July 16. “Working with Israel is a great thing and creating safety for Israel is something both Putin and I would like to see very much,” Trump said. Putin said Trump had made Israel an important part of their talks and that the conditions were in place for effective U.S.-Russia co-operation concerning the security of Israel at its border with Syria. Netanyahu’s office issued a statement shortly after the Trump-Putin press conference. Trump also said he and Putin wanted to help the Syrian people on a humanitarian basis. “Our (U.S. and Russian) militaries have gotten along better than our political leaders for a number of years. And we get along in Syria too,” Trump said. Trump also said he had stressed the importance of putting pressure on Iran, an ally of Russia, while Putin said he was aware of U.S. opposition to the international nuclear agreement on Iran, which Russian supports. Netanyahu has made clear Israel’s position that any outcome to the Syrian conflict war would have to include the absence of Iranian forces and its terror proxies such as Hizbullah from the border. The Israeli prime minister has made repeated visits to Russia in an effort to persuade Putin to use his influence in Syria to remove all Iranian forces from near the Golan Heights.